Noam Chomsky Quote. 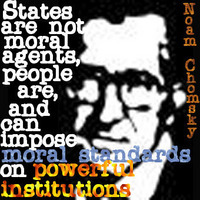 "States are not moral agents, people are, and can impose moral standards on powerful institutions.". Images in the Human Rights club tagged: human rights noam chomsky quotes icon.